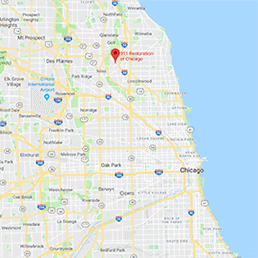 Skokie once called itself “The World’s Largest Village.” With a population of over 64,000 people, Skokie is a suburb of Chicago in Northeast Illinois. Housing the Illinois Holocaust Museum and Education Center, as well as the beautiful North Shore Center for Performing Arts, Skokie has been seen as one of the top 100 best places to live in the United States. Unfortunately, even in such wonderful suburban areas our water damage Skokie technicians find leaks and floods. If you feel a trickle starting in your basement, call us before it causes water damage or when you need water restoration services for a pipe burst or toilet overflow. Call our water damage Skokie crew when you have plumbing leaks or rain leaks from storms. Along with contacting us, you should also turn off your main water valve and electricity to prevent further disaster such as mold growth and short circuits. We are certified by the IICRC to help you with all disaster restoration services. it is important that you have a professional company help you with all of these scenarios because black water from a toilet overflow and the mold spores from fray water present significant health risks. We use the latest drying technology and full hazmat suits to safe safe in the even of tragedy. Contact a qualified and professional restoration company such as 911 Restoration Skokie for thorough water extractions. We proudly offer same day service at an affordable price to help our clients in their time of need. If you experience flooding in your home, we advise that you turn off the electricity as a safety precaution and move your belongings and furniture away from the water if you can do so safely. Our water damage Skokie personnel will be on the scene fast and take it from there. Because emergencies can strike as a result of forces beyond your control, we are available 24/7 and respond within 45 minutes. We are working with all insurance companies to make sure your homeowner’s insurance covers water damage. Homeowner’s insurance covers water damage Skokie services as long as you keep up with regular preventative maintenance. You should clean your rain gutters and ensure your downspouts are pointed away from your foundation to keep rain water out of your home and prove that you are a responsible homeowner. If water leaks into your roof, mold remediation is often required in conjunction with water removal, as the excess moisture is a breeding ground for harmful spores to develop. You should also install a sewage back flow valve, insulate your plumbing, and test your sump pumps to prevent floods from a toilet overflow, washer burst, or other appliance failure. According to the Insurance Information Institute, water damage is one of the most common forms of insurance loss, so taking these steps can save your property from disaster and secure your policy so that you can fun the water removal needed after floods. Call us when you are looking for the best water damage company in Skokie. 911 Restoration is the best water damage Skokie company because we can handle all disaster restoration services with over 35 years of experience and we always put the customer first. We are working with all insurance companies and we are licensed, insured, and bonded because we value professionalism. Let us take the messy paperwork off your hands and file your claim to maximize your coverage and keep any out-of-pocket expenses to a minimum. Our goal is to keep stress and water damage minimal. Our water damage Skokie technicians have over 35 years of experience in all disaster restoration services and work hard to make your restoration experience as tranquil as possible. Call us for a fresh start in the city of Skokie and see why we are the best water damage restoration company.